At spcaLA, we limit our group classes to between 4 and 8 dogs. This “semi-private” setting allows you to work with spcaLA’s expert trainers to set you and your dog up for a lifetime of happiness. 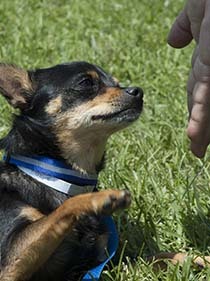 Not only are spcaLA group classes affordable, but our techniques focus on positive reinforcement and fun with your dog! We offer basic through advanced obedience for dogs and puppies, as well as agility classes (for the novice or the competitor), specialty classes like Fun Nose Work, Come When Called, Trick Training, and more! Leave a message and one of our trainers will return your call. You can also email your questions to training@spcaLA.com.